You've mastered Intro to Swing and honed your skills in Lindy Hop Essentials but you need more Lindy hop in your life! Intermediate classes expand on the fundamentals of the beginner lessons, getting into more complex techniques of partner and rhythm skills, and cover diverse patterns and figures. Each of the three Intermediate series (A, B, & C) covers different material to give you the technique, steps, moves, and confidence you need to step boldly onto the social dance floor with any partner. You may take them in any order. Solo Jazz and Advanced-Intermediate Lindy hop workshops upcoming! Click the links for more info and to register. Intermediate students enjoy a discounted admission of $5 to the regular DJ'ed weekly dance, Rhythm City Strut. For band nights, please purchase tickets here. Find yourself missing out on dancing because the tempos just aren't right for you? Learn the techniques you need to be comfortable at any tempo, especially those famous fast swing songs. This class will also cover new moves that work especially well when the music gets hot. Tain't whatcha do, it's the way that you do it! 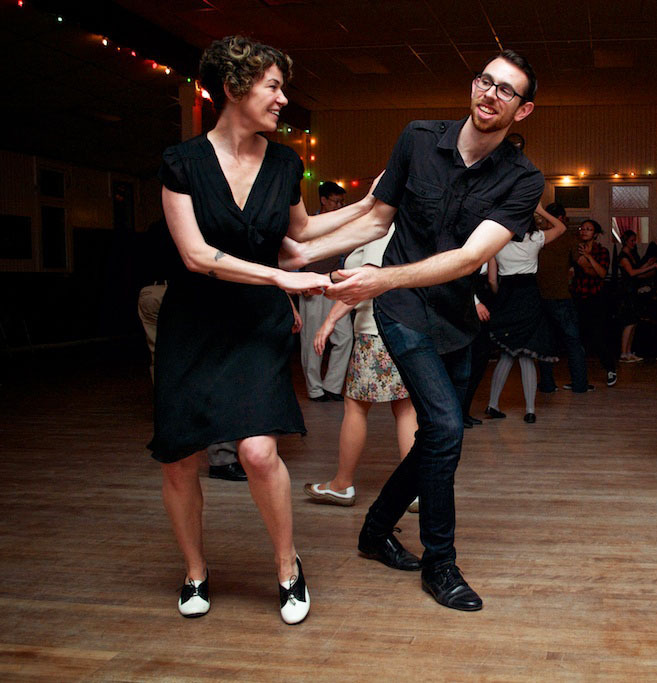 This series explores the connection between swing music and lindy hop, focusing on variation, stylings, and other ways to dance to more than just the beat. Frankie Manning was one of the original lindy hoppers who came out of retirement in the 80s to teach the next generation how to swing - Lindy Hop today would not be the same without him. This class will focus on Frankie's favourite moves and stylings, as well as tips & techniques to help you dance like the master. A new series that will take you on a whirlwind dance history tour! We'll start with Lindy hop's celebrated ancestor, the Charleston: the energetic, upright, bouncy, iconic dance from the 1920s. This will take us through the Break-away, the missing link between Charleston and Lindy hop, and into the Swing dance we know and love. You'll gain a deeper understanding of Lindy hop, as well as greater versatility on the social dance floor, for when those peppy and older-sounding tunes are played.